Ellsworth "Dutchy" Barnard attended Massachusetts Agricultural College, and received his Bachelor of Science degree in 1928. Barnard began teaching college English in 1930 at Massachusetts State College. In the fall of 1957 he took a position at Northern Michigan University (NMU). As chairman of the English department, Barnard presided over a selection committee which brought the first African-American faculty member to NMU. During the 1967-1968 academic year, he led the faculty and student body in protesting the dismissal of Bob McClellan, a history professor. 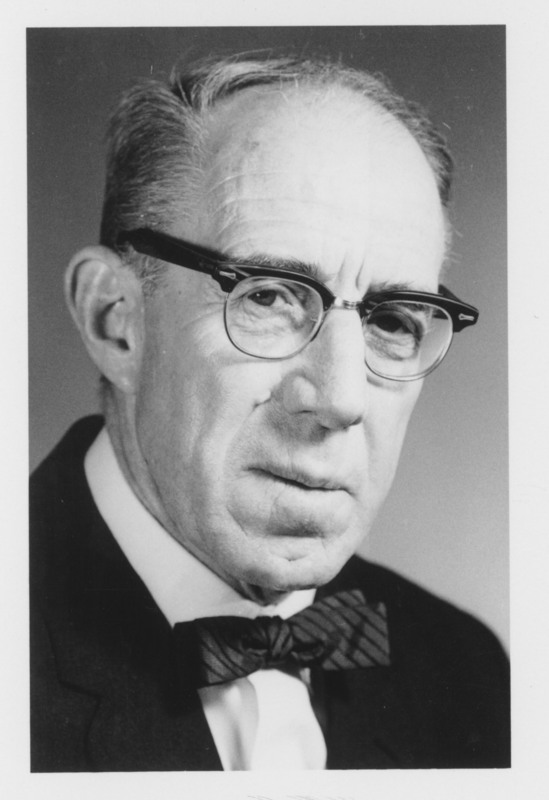 Although the effort to reappoint McClellan was successful, Barnard had already tendered his resignation at NMU and returned to the University of Massachusetts at Amherst for the 1968-1969 academic year. He ended his career at UMass as the Ombudsperson, the first to fill that office. Barnard retired in 1973 and lived in Amherst until his death in December 2003. Barnard's papers document his distinguished career as an English professor and author, as well as his social activism, particularly on behalf of the environment. They consist of course materials, personal and professional correspondence, drafts of essays, lectures and chapters, published works, a collection of political mailings, a number of artifacts both from the University of Massachusetts and other educational institutions and organizations, and a number of poems by Barnard and others. Ellsworth 'Dutchy' Barnard was born in Shelburne Falls, Massachusetts, on April 11, 1907 to farmers David and Kate Barnard. After receiving his Bachelor of Science degree from Massachusetts Agricultural College in 1928, he continued on for a Master of Arts (1929) and Doctorate (1935) at the University of Minnesota. He was a lifelong naturalist and birdwatcher. While still writing his dissertation, Barnard began teaching, first at his alma mater in 1930, now renamed Massachusetts State College, and then at the University of Tampa in 1936, the same year he married Mary Taylor. After publication of his dissertation on the religion of the poet Percy Bysshe Shelley in 1937, he accepted a position at Williams College, however he and colleague, Nathan Comfort Starr were dismissed in 1940 under what was considered scandalous circumstances. Barnard rebounded by accepting a position as head of the English Department at Alfred University, where he worked for nine years beginning in the fall of 1941. A politically progressive critic of isolationist tendencies in the United States, Barnard had written in support of American entry into the Second World War as early as January 1940, and during his stint at the University of Wisconsin at Madison in the academic year 1940-1941, he spearheaded a faculty petition encouraging immediate aid for Britain and the Allies in Europe. Although rejected for military service when he tried to enlist after the attack on Pearl Harbor, Barnard taught in the Army Specialized Training Program at Alfred, instructing potential officers how to write accurate and readable reports. The conflict with the administration that Barnard had experienced at Williams was repeated under two different presidents at Alfred, and after Barnard's refusal to swear that he was not a member of the Communist Party, he was forced out of his position in 1950. After a brief appointment teaching a summer session at the University of Rochester that year, he remained unemployed for two years, devoting his time to completing his second book, Edwin Arlington Robinson: A Critical Study, published in 1952. With the completion of the Robinson book, Barnard secured a position at the University of Chicago, remaining a provocative figure in advocating for civil liberties. In his article "Communism is not the Question" (written in 1953, but published in 1955), he directly criticized the practice of barring communists from academic positions. During his three years at Chicago, he also began to build a home at High Ledges, a plot of land in Shelburne Falls that he had purchased with his wife. After Chicago, Barnard held a one-year appointment at Bowdoin College, during which he began to explore a new and controversial system for teaching English grammar that focused on actual usage rather than specific rules, and he launched into a biography of Wendell Willkie. Moving on to Northern Michigan University in the fall 1957, he developed a system of student evaluations for professors, and remained long enough to rise up the ranks and become department chair in 1962-1963. He presided over a selection committee which brought the first African-American faculty member to NMU. In 1961, after taking a leave of absence from Northern Michigan University for the fall of 1960, Barnard completed work on his biography Wendell Willkie: Fighter for Freedom (1966). Like his subject, Barnard remained politically active, leading a faculty and student protest against to the dismissal of Bob McClellan, a history professor who had opposed administrative policies. Although McClellan's dismissal was avoided, Barnard had already tendered his resignation and returned home to Massachusetts to accept a position at the University of Massachusetts Amherst. The latter years of Barnard's career at UMass were highlighted by continued work on Edwin Arlington Robinson and a series of self-published autobiographical works, as well as publications on teaching grammar. The last two years of his career at the University (1971-1973) were filled in the newly-created office of Ombudsman. Even in retirement, Barnard continued to write. In 1998, the Massachusetts Audubon society published his book In a Wild Place: A Natural History of High Ledges, and his own Dinosaur Press issued both a collection of his poetry, Verses in a Vanished Mode (2002) and a posthumous collection of essays, Don't Give Up the Fight, Ever. Barnard lived in Amherst and High Ledges until his death on December 29, 2003. The papers of Ellsworth 'Dutchy' Barnard document his long and distinguished career as an author and professor of English, as well as his social activism and environmental conservationism. The papers contain the usual detritus of an academic career, including personal and professional correspondence, drafts of essays, lectures and chapters, published works, and course materials, along with a collection of letters to the editor (both published and unpublished), political correspondence, and a handful of artifacts. The collection is organized in 6 series: General correspondence, Subject files, Politics, Course materials, Published works, and Realia. The Correspondence consists of letters to and from Ellsworth Barnard. There are three types of correspondence in the collection. Folders labeled "Correspondence" hold letters organized alphabetically by correspondent. While original order could not be maintained for the bulk of the correspondence, in cases where a clear grouping of correspondence on a single subject existed, the order was maintained. In cases where other material clearly relevant to the correspondence was grouped with the correspondence, the additional material was included with the correspondence. The Subject Files contain materials relating to specific topics grouped by subject and medium. The politics series includes correspondence with public officials, writings on political topics and political publications and mailings. This series contains lecture notes, syllabi and assignments for classes taught by Ellsworth Barnard. Because the material was mostly unorganized when received, it has been organized by subject, course number and course title, depending on available identification, in alphabetical and numerical order. This series includes Barnard's published books and publications with articles or essays by him. It also includes a small collection from his personal library. Below is a listing of included works. This series consists of a variety of artifacts from Barnard's time at the university, as well as audio and video cassettes and academic scrolls. "In Sunshine and in Shadow Vol III: Life in the Ivory Tower"
Press and Publication: "Generally Speaking"
Press and Publication: "Robinson's Reputation"
Harper's Magazine "War and the Verities"
Vital Issues: "The Road to Peace"
Liason: "Two New England Poets"
Liason: "That War is Never Won"
College Composition and Communication: "On Teaching Teachers"
Gift of Mary Taylor Barnard, widow of Ellsworth Barnard, 2004. Processed by Michael G. Herman, March 2007. Cite as: Ellsworth Barnard Papers (FS 002). Special Collections and University Archives, University of Massachusetts Amherst Libraries.